The Iiyama ProLite is a nice cost affective option for anyone looking to buy a gaming monitor right now. This screen offers a QHD 2560 x 1440 resolution, a blazing fast 1ms response time and a 70hz refresh rate. Sure, it doesn’t offer the 144hz that many gamers are after but there are good improvements even when you nudge over 60hz with diminishing returns the higher you go. This monitor also comes with the FreeSync adaptive synchronisation technology from AMD. 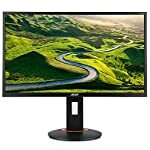 You’ll need a FreeSync compatible graphics card to take advantage of this but you can of course buy the monitor without this capability – perhaps with a view to upgrade your card at a later date. This monitor, at the time of writing, is one of the more cost effective gaming monitors out there. The FreeSync route is always going to save you a few pounds compared to the G-Sync – Nvidia charge a fee to include the proprietary technology in the monitors. But a 27″ 1440p with adaptive sync included is exactly what many demanding gamers are be looking for right now. The Iiyama build is solid enough and whilst not premium this monitor has many positives, you get a black plastic casing which is inoffensive enough and won’t look out of date in a couple of years time. There is a matt screen with an anti-glare finish and also a very thin bezel which I always thinks makes monitor look that much smarter. This won’t look out of place on your desk. The stand has a decent range of adjustments, you can do all the standard tweaks – height, swivel, tilt and even includes a smooth rotate option so you can put it into portrait mode if that’s what you prefer. You get all the connection options you’ll need, including HDMI, a DVI Dual Link port and a DisplayPort socket which you’ll have to use if you want to take advantage of FreeSync. Some users suggest the on screen menu system isnt the most user friendly but at least this is something you should only have to set up once. The ProLite B2783QSU has an out of the box response time of 7ms, which is actually reasonable for a TN screen. As you’ll see, the quoted response time for this monitor is 1ms which is achieved by switching on the overdrive function. This does a great job of reducing down ghosting effects. The monitor also scores well for input lag making this a great option for game focused buyers. It is worth noting that out of the box power usage is fairly high, but this drops off if you reduce the brightness. However there are monitors out there that have a better power rating if this is something that is important to you. The B2783QSU includes FreeSync which is AMDs open adaptive synchronisation technology, it does a good job of cutting down tearing and smoothing out the images. You’ll need a PC that can output frames for any given game in the region of 50-70 frames per second, the maximum refresh rate is 70Hz and if you drop too low even FreeSync is not going to help you get smooth animation! 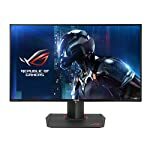 Given the price, this is a good monitor for gamers. We give the Iiyama ProLite B2783QSU a 4.5 out of 5 rating. Want to know what existing owners of the monitor think? You can read real user reviews here. 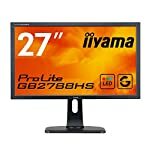 Should I buy the Iiyama ProLite B2783QSU? Welcome to the Iiyama ProLite B2783QSU FAQ. This section attempts to answer common questions you may have, please get in touch if you have any more queries or if you think our answers need updating. Yes! In fact it comes with a DVI cable, a DisplayPort cable, an HDMI cable and an audio cable! Although please check with your supplier if concerned as packages can vary from region to region etc.